Sometimes when we live around Amma, events of true giving arise from places of such compassion, it never ceases to surprise. The results go beyond what could’ve even been imagined. The story of Pandit Arun Sharmaji is one of these stories. Arunji was born in Indpur, Himachal Pradesh, a village where Amrita SeRVe is working. Arunji’s family taught him how to be of great benefit to the world. His grandfather took time to do social service by helping construct local roads and walking a long way to teach for free in the government school. Pt. Arun Sharmaji and family. In 1998, Arunji had his first meeting with Amma, so to speak. 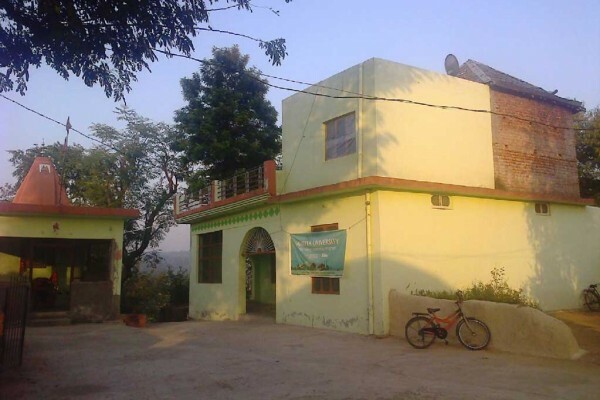 He met Ashok Rehlaji and Meera Rehlaji, who ran a guesthouse in Dharamshala, the city nearest Indpur. The Rehlas are close devotees of Amma and gave Arunji a copy of Matruvani and some of Amma’s books. 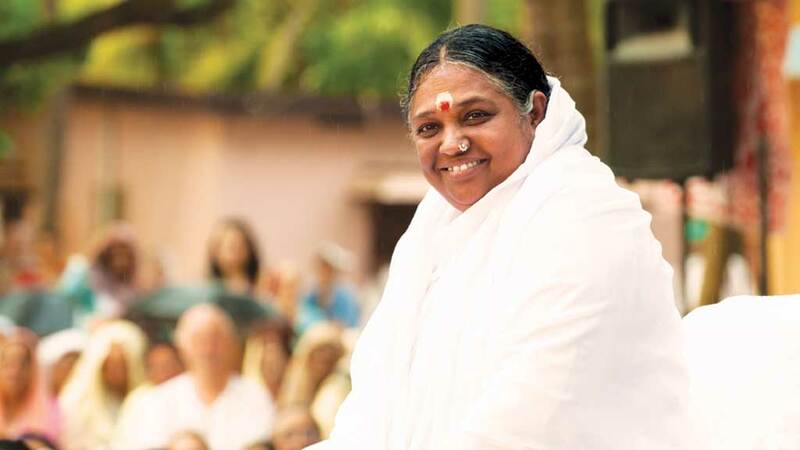 After reading Matruvani, Arunji was deeply moved to learn about Amma’s humanitarian work. Right from his heart, he felt that Amma is a lamp removing darkness from people’s lives. From that day forward, he continued reading Amma’s books and at times, something strange would overtake him. A feeling of Divine Love. It is somewhat difficult to put into words, but Arunji says he felt it was Amma Herself coming to visit him. This event took place seven times. 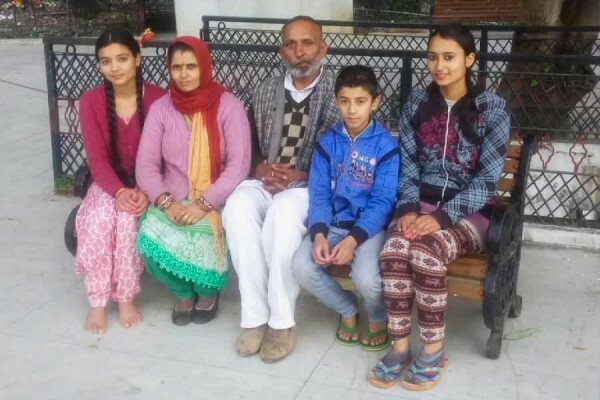 In 2011, Arunji moved his family to Dharamshala for his children’s education and locked up his house in Indpur. 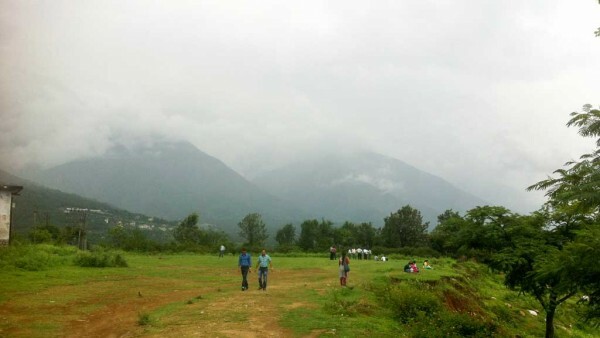 He went in search of a property to buy in Dharamshala, but it was difficult, as nothing ever came within his goal of good condition at an affordable price. He did not know what to do, other than throw his hands up and wait. During a visit one day to Ashokji and Meeraji’s home, Arunji met Br. Sureshji who is working with Amrita SeRVe. Sureshji was talking about how they were having trouble in the village of Indpur because the Amrita SeRVe people working there did not have a place to stay. Meeraji turned to Arunji and asked him if he had any ideas on how to help. Arunji immediately said he was happy to give his own house to Amrita SeRVe and that he absolutely refused to take any rent. The decision flowed to him as quickly and naturally as the wind. For Arunji it was quite simple. He had always wanted to do something for his village, but because he had to move to the city for a job, he was not able. Once Amma had adopted his village, he was able to donate his house to help. He feels Amma gave him a great opportunity to be of service. Arunji, however, says the much more important thing is that Amma’s work has been started in his birthplace of Indpur. They are very fortunate because they are beginning to know and accept Amma for who She really is. Arunji humbly feels that he has not done anything.